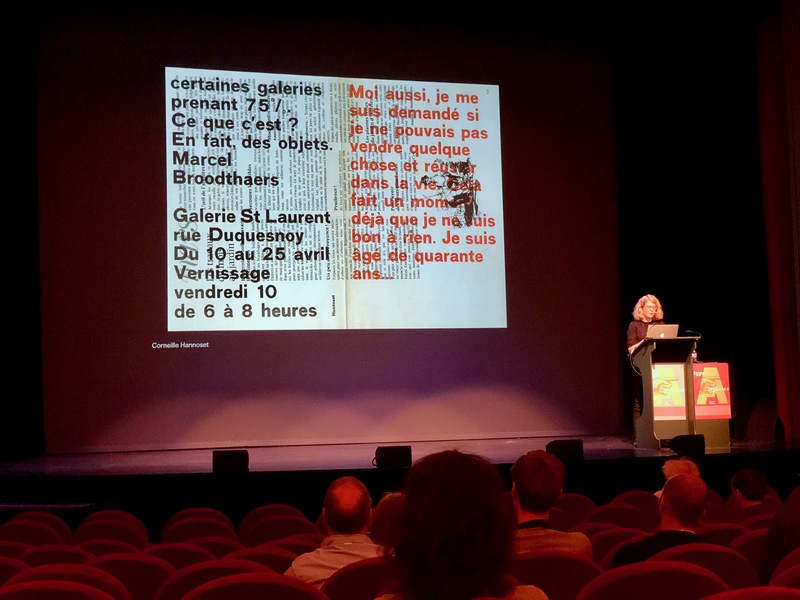 This year the ATypI conference took place in Antwerp under the theme Type Legacies. There was a big representation of Alphabettes at the conference. Sabina Chipara, Joana Correia, Kimya Gandhi, Laura Meseguer, Inga Plönnigs, María Ramos and Tânia Raposo wrote their views on this years ATypI. It was the first time that I attended ATypI and I also had the opportunity to present my research in front of such a great audience. I was filled with emotions, anxious and nervous but very happy at the same time. I liked the way the schedule was made by mixing research from different cultures, presented by experienced speakers and new voices that had the opportunity to be on stage for the first time. Just thinking about how many designers whose work I admire, were in the same room, it’s impressive! ATypI is also a great opportunity to see friends that live all over the world and share with them ideas and thoughts. I now have many more friends that live all over the world that I can’t wait to see them in the future or collaborate on specific projects. 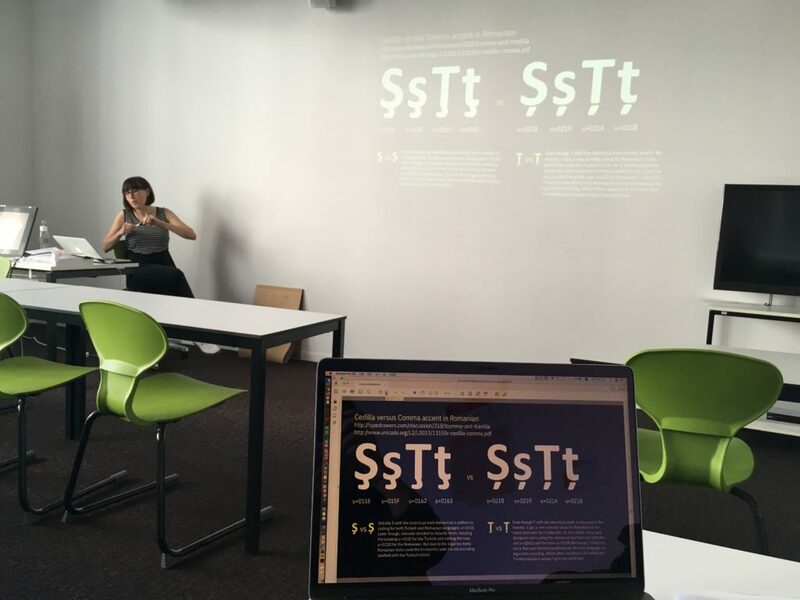 I attended the workshop Designing Diacritics: more than a production detail with Aleksandra Samuļenkova. That was great! We had a good class dynamic where everyone was asking questions and stating out their design practice. Some of my favourite talks were Women in type by Fiona Ross & Alice Savoie, Adidas variable fonts by Jeremy Mickel & Leon Imas, Introducing the first variable font by Petra Rüth, and of course the great show offered by Bruno Maag and Rainer Erich Scheichelbauer in the debate about The German sharp S.
I could say that the first day programme was a bit difficult to follow as it happened in two rooms simultaneously and due to schedule delays moving from one talk to another became a bit hectic. 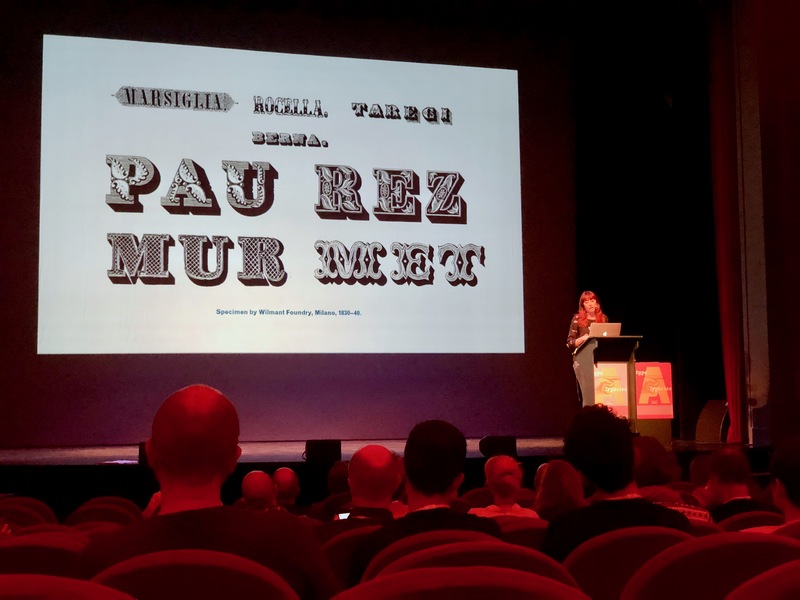 This year ATypI 2018 was a fantastic event full of knowledge and perspectives from researchers and type designers. The talks in the first sessions were rich in content, and many first-timers were speaking. After my own presentation, I listened to Julian Moncada, a former colleague of mine in Reading and I enjoyed a lot his talk. He brought the idea of more experimentation in the design process for students while attending university programs in typography. Breaking ground with the rules in an educational controlled environment allows for more personal and artistic expression for type designers. Later in the week the talk by Matthew Carter, the opening keynote for ATypI, was again in a very similar note! He talked about experimentation in type design, and it was a great way to start this conference! The week followed with fantastic content. 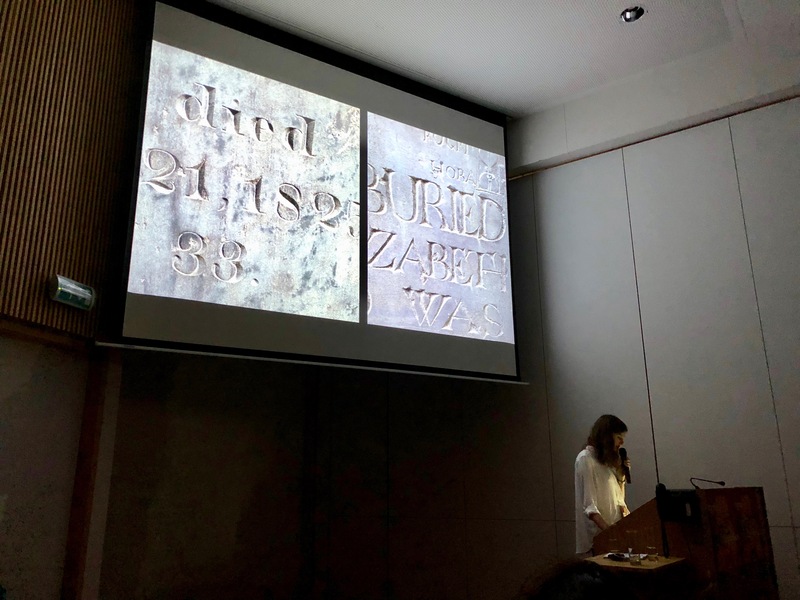 Some of my favourite talks were as mentioned above, Women in type by Fiona Ross and Alice Savoie, and Aspects of Italian type history by Marta Bernstein, Antonio Cavedoni, and Alessandro Colizzi. Also, learning about the craft of punch cutting by Ramiro Espinoza and the last keynote by Nelly Gable and Annie Bocel brought me a bit closer to this amazing craft. I would like to celebrate the recipient of the Prix Charles Peignot, David Jonathan Ross that has been a personal inspiration for the last years. He gave a heartfelt presentation of his work and how he approaches the industry right now. He talked about our industry becoming more open and inclusive in every way, which shows a will to evolve in our community. He has become a fantastic role model for new generations in type design. Besides all the amazing talks and workshops, ATypI is a moment where the worldwide type community gets together in one place. It is a time for sharing ideas/projects and improving our friendship in helping the field evolve and be respected and recognized in our society. This year was a very special ATypI, and I look forward to the next one! This was my first time at ATypI and I was very excited to make the long trip from India. Better yet, I got to be a small part of this year’s programme, and was delighted to share space with the very talented Inga Plönnigs — whose work I greatly admire. Inga, Mateusz Machalski and I spoke about our process and projects in a session called Type Insights. Unfortunately, as Tania mentioned due to the timing of the session clashing with other workshops, not many could attend. I do think the intent of this session is great and I can see it be beneficial, maybe next time it can be scheduled after the workshops are done. Nonetheless, I was very glad to be given the opportunity to be a part of this event, and would like to thank everyone who attended the session. 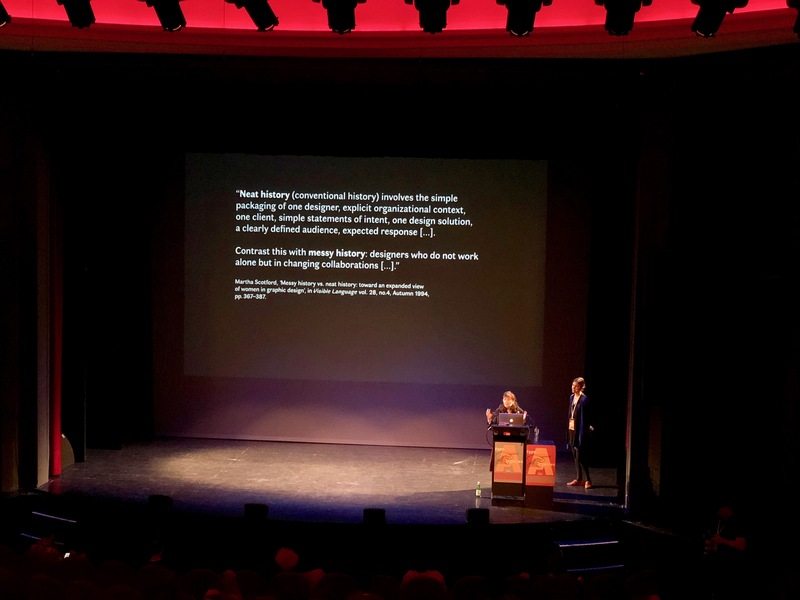 The main programme was held at the gorgeous Arenberg theatre, which served as a great backdrop to this year’s conference theme, Type Legacies. Here is a list of my favourite talks from the conference. Great presentation with great visuals and storytelling. For someone who didn’t study type design as a formal discipline, this talk gave in-depth insight into the making of punches and I applaud Ramiro’s endeavour to learn to cut punches and keep the skill alive. Inspiring area of research, I couldn’t think of two women more apt for presenting a research on women in type. Looking forward to this research and hearing many more untold stories. A well-presented research, that gives appropriate context to design decisions. Shani is one of my favourite speakers, her ability to summarise her extensive research so eloquently is something I greatly admire! Three very interesting presentations filled with inspiring visuals of letterforms. Even though by the end of the conference I was overwhelmed with information, I must mention the extraordinary work presented by Nelly Gable. Watch this for images of exquisite punches cut by her and great sketchbook images by Annie Bocel. The most well deserved DJR won the Prix Charles Peignot and gave a fitting acceptance speech, which is a must watch for designers of all ages. David’s presentation was important because it struck the right balance in showcasing his humble yet exemplary design journey and using this platform to talk about matters of inequality and inclusivity. Overall, the conference was great, though as many others have mentioned in this post, I would have liked to get a sense of how the learnings from history can be applied to present design environment. It would have also been nice to have more representation from India, and I would definitely encourage more designers to participate in the conference in the future. I appreciate the organisation’s steps to reduce membership fees and implement new programmes like the working seminar that will be held in Sri Lanka next year! Despite I couldn’t attend all the talks I wanted to contribute with a brief report on my highlights for this last ATypI in Antwerp. As you all know the theme for this year was Type Legacies and I think it was accurately represented in many ways. Some of the talks have been commented above, so I will focus in a few of them. When I just arrived in the city I had the chance to attend the workshop given by Jim and Bill Moran from the Hamilton Wood Type & Printing Museum at Letter-Kunde, it was not the only one happening there at the same time, all together felt like a letterpress printers party, where everybody was welcome to join. It was the best start. On the first day, I was really pleased to listen to those who talk about Experimentation, being Matthew Carter the first with his keynote presentation Over the top but also those that use that experimentation to go further on their own Craft. This was present in two talks: Ramiro Espinoza on the value of learning punch cutting on the XXI century, and Aoife Mooney with her Typo/graphic texture an exploration of the relationship between patterns, language, and type through the weaving process. I always miss having more graphic design related talks at type design conferences. I especially enjoyed the last part related to Occasional Papers, a non-profit publisher of books devoted to the histories of architecture, art, design, film, and literature. I think Graphic Design can’t be detached from other disciplines, so it is the same with Typography and Type Design. I cannot finish without mentioning my favourite talk(s) Aspects of Italian type history: Bodoni to Nebiolo, Novarese and Butti, and Simoncini’ by Marta Bernstein, Alessandro Colizzi and Antonio Cavedoni. You can follow their project at www.nebiolohistory.org. It filled my brain and heart with amazing letterforms that confirm, once more, my love for our profession. After attending my first ATypI in Warsaw in 2016, I was excited to go to an ATypI conference for the second time. Two years ago, I liked the division of the first day into business and education track and a separate technology track. This year, there was no such structure and I think that it would have helped to choose which talk to go to. Overall the organization in Antwerp seemed slightly chaotic. Having Type Legacies as the topic of the conference, it was not surprising to hear a lot of talks about the history of type, with a view more of a retrospective than an outlook. I was hoping to hear opinions on how to use the rich heritage in type design when drawing type today, a valuable takeaway for my work as a type designer. But I think that a link to the present was missing in many talks — at least in the talks that I have seen. My highlights in this week full of interesting conversations were the talks by Daria Petrova and Bahman Eslami. Although handling subjects not related to my work, they shared valuable thoughts and advice applicable to other issues as well. It was great to see young designers delivering outstanding and honest presentations. I can’t leave it unmentioned: David Jonathan Ross won the Prix Charles Peignot and gave a prize acceptance speech that showed not only that his work is worthy to be rewarded, but also his sensitive attitude by using the opportunity to support underrepresented people in the type community. The type industry is a global community that every now and then have the chance to meet in person. ATypI is the perfect excuse for an annual gathering. It is easy to feel overwhelmed because of not finished conversations and the huge amount of new information you get in such a short time. In the end, you create your own experience taking pieces from here and there. I would like to recommend a couple of talks for those of you who were not in Antwerp. I really enjoyed the presentation by the keynote speaker Sara de Bondt, not only because of the showcase of projects but mainly because of her reflections and approach to work. On the occasion of the 10th edition of the Prix Charles Peignot, we had the chance to listen to the well-articulated speech by David Jonathan Ross. Despite his youth, he is already a role model in the industry. For one week, Antwerp was the capital of typography and we got the chance to gather around people who are the live history of type design. I will add one main complaint. I think it would be good, both for organisers and attendees, to create a more condensed programme. The schedule is so packed that people don’t have the energy and time to exploit their typographic trip and get immersed in the cultural treasures of every year’s new venue. This was my first ATypI conference. I always wanted to go to one but I didn’t have the opportunity before. I was also excited to attend a conference that, for once, was mostly about research and less about self-publicity. I didn’t attend all of the talks. After two days, one can get overwhelmed and low on energy to fully absorb more and more content. The conference feels too long and I will reconsider my attendance days at future ATypI conferences, especially the first day of lectures with two tracks. 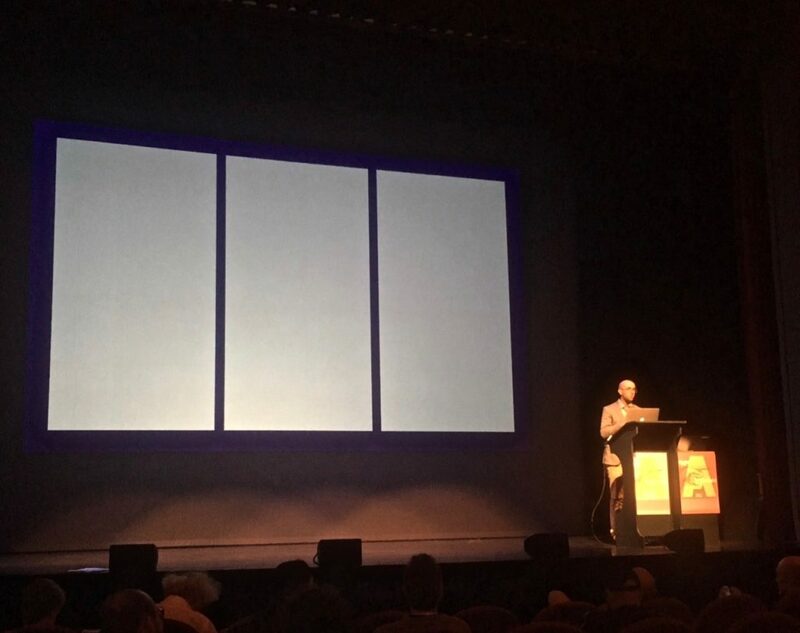 Naturally, you cannot see two talks at the same time, but they were also not in sync, so if you wanted to switch tracks, you’d have to leave mid-lecture. 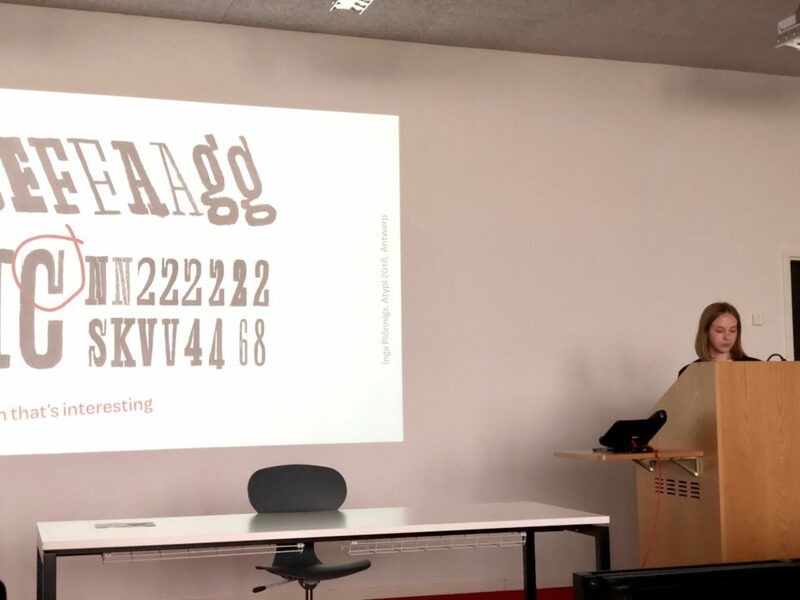 I would like to highlight the three lectures given on the “workshops” day, disguised in the program as Type Insights, by Kimya Gandhi, Mateusz Machalski, and Inga Plönnigs. The series was supposed to serve as inspiration mainly for students or recent graduates, given by speakers that have been working as type designers for a relatively short time. Unfortunately, they were quite hidden in a day of workshops and not a lot of people knew of it. The lectures gave an interesting insight into the designers’ process and it would have been great if more students or recent graduates had been present/aware. This year’s theme Type Legacies made people focus more on the past, which can be very interesting, but overall, in highly historical talks I felt a lack of connection with the present. What are the implications of this historical research in contemporary and future practices? As more people have mentioned in this post, David Jonathan Ross won the Prix Charles Peignot, a very well deserved recipient. David gave a beautiful acceptance speech, where he also touched on the subject of inequality in our field, followed by a personal and endearing tour of his work and process. Maybe next time the prize is awarded it would be good if the jury is not only comprised of white men. Also, It was unfortunate to see two talks getting cut short, Radek Sidun and Fred Smeijers. It would be helpful to have a volunteer warn speakers about the time left more clearly. The talks were continued at a different time the following days but this was not very well communicated and not well attended. All in all, the venue was beautiful and central; it was great to be able to escape from time to time to have a stroll through the city center or walk through the botanical garden around the corner. I enjoyed making new friends and hang out with old ones. In the end, the people are what matters most. Some of us included links to talks on our texts. At the moment of the publishing of this article not all talks were made available online by ATypI yet, so make sure to check their Youtube Channel to be updated. Graphic and type designer. Obsessed with type and books, books about type and all type of books.